Did you know that onions are low in calories? Onions have only about thirty calories per serving. Onions have no sodium or fat and are cholesterol-free. The onion provides fiber, Vitamin C, B6, potassium, and other key nutrients. Onions also contain generous amounts of quercetin. Quercetin is believed to help protect against cataracts, cardiovascular disease, and cancer. In addition, onions contain a variety of other natural occurring chemicals known as organosulfur. Organosulfur has been linked to lowering blood pressure and cholesterol levels. 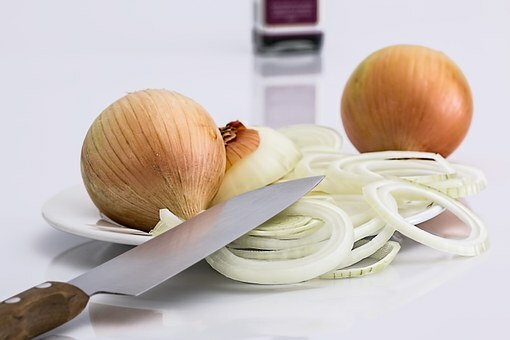 If you have ever sliced an onion, you know that tears and onions seem to go together. Before you can reap the good of the onion, you have to experience the tears. Have you ever considered the following: the sound and reason for crying changes, but never does it stop. All infants do it everywhere—even in public. By adulthood, most crying is done alone and in the dark. Weeping, for babies, is a sign of health and evidence that they are alive. Isn’t this a chilling omen? Not laughter, but tears are the life sign. So the next time you are slicing that onion and tears start to flow, remember that tears, not laughter, are a sign of health and life. ✞ When you see or taste an onion, remember that tears are a sign of life.